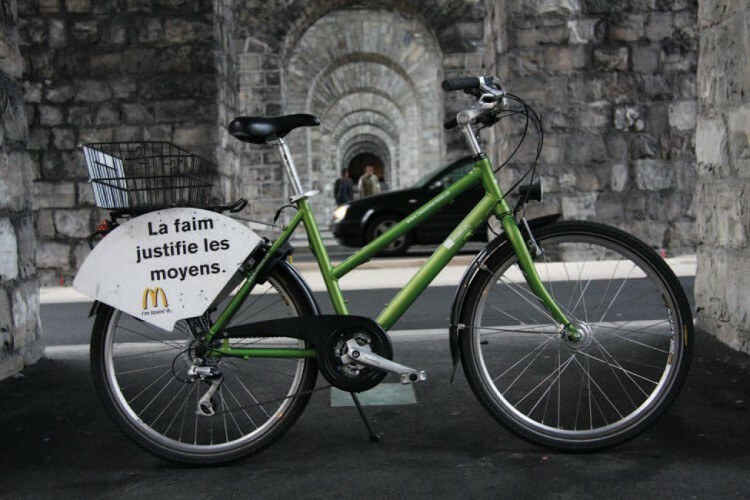 Rental bikes for the free-of-charge bike rental operator „Lausanne Roule“ and „Vevey Roule“. A classic ladies‘ bike with an aluminium 26“ frame and steel fork. This version was equipped with Shimano Alivio 24-gear chain shifter, Rollerbrakes and a version with the Shimano Nexus 8-gear hub shifter and Rollerbrakes. Hub dynamo and fail safe cabling and wiring also through the rear carrier. The baggage carrier was designed to mount advertising panels on the sides. The seat posts are secured with a steel cable to the frame. In the meantime Lausanneroule belongs to Velopass.